Who would have ever thought just a few years ago that the sweet potato is now considered by nutrition experts to be one of the 10 Healthiest foods to eat? Not only are sweet potatoes healthy for humans, they are nutritious for dogs as well-packed with antioxidants and anti-inflammatory properties. 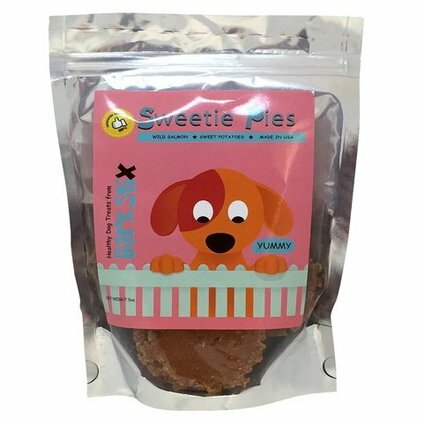 Ingredients: Sweet potatoes, free-range chicken liver, potato flour, honey and sea salt. Guaranteed Analysis: Crude Protein (min) 18.3%, Crude Fat (min) 8.5%, Crude Fiber (max) 4.0%, Moisture (max) 16.5%. Ingredients: Sweet potatoes, wild salmon, potato flour, honey and sea salt. Guaranteed Analysis: Crude Protein (min) 11%, Crude Fat (min) 5%, Crude Fiber (max) 3.0%, Moisture (max) 13.5%.